As a huge believer in anything tea-related, I love sampling any kind of tea I can get my hands on. When I got a hold of Mighty Leaf’s Chamomile Citron, it was like love at first sip. I knew I had to make some kind of dessert with it, one that wouldn’t hinder its delicate citrus notes and natural sweetness. And so a mousse it is! 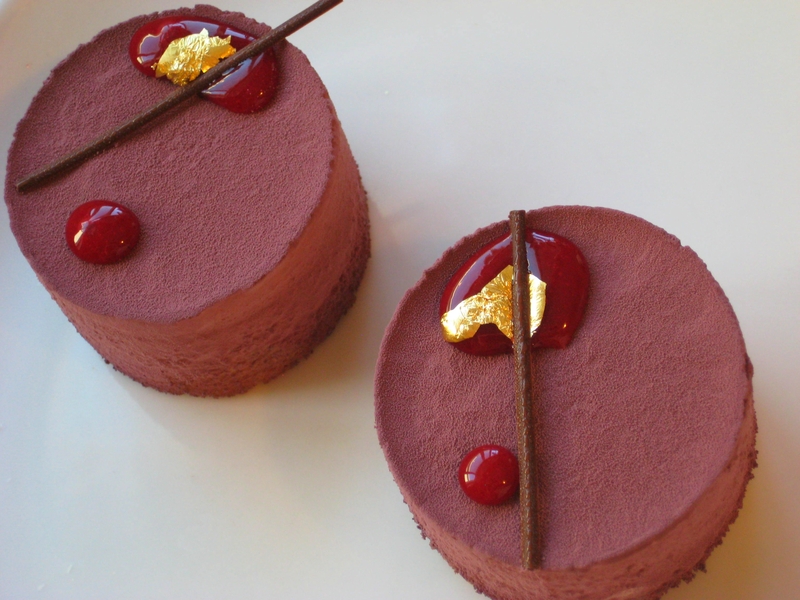 For the base of this entremet I used a simple vanilla and almond cake, then made a mousse using both chamomile and lemon verbena teas, sprayed it with colored cocoa butter, and topped it with some raspberry coulis, gold leaf, and chocolate decor. 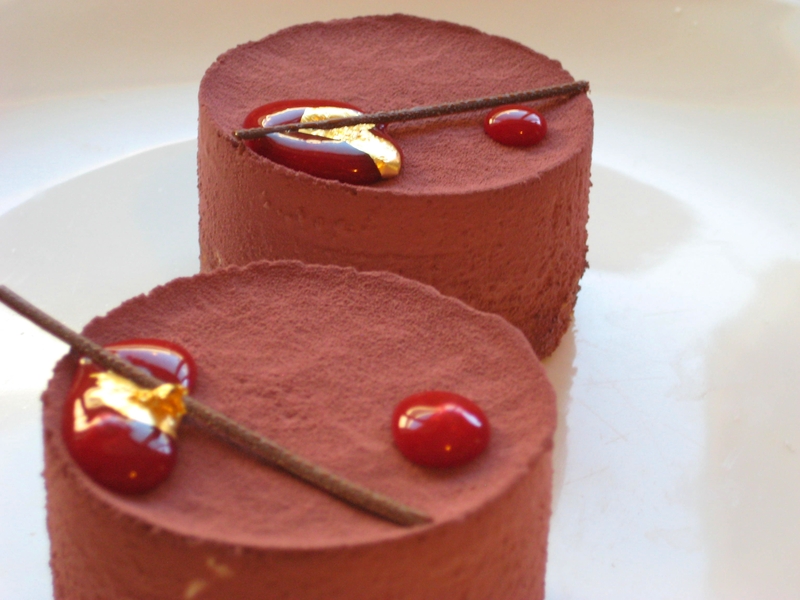 The mousse is luscious and creamy, with the same citrus flavours presented in the teas, while the cake provides a pleasant subtle sweetness along with it. 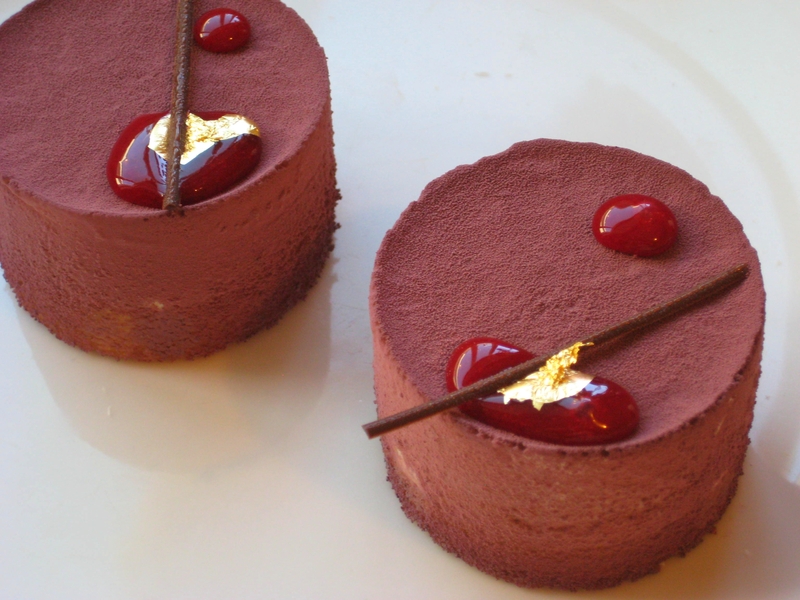 The raspberry coulis provides the entremet with a nice pop of flavour as well. 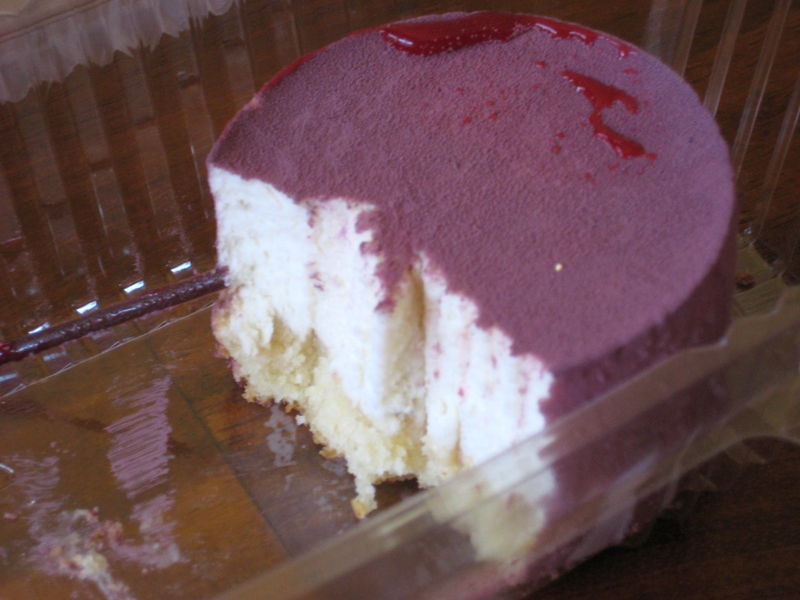 When it was done, I excitedly brought one to my fiance’s home, where it was devoured in seconds. By him. Or me. Okay, mostly me. Oh yeah, and he liked it too! Preheat oven to 350F. In a bowl of a stand mixer fitted with a paddle attachment, cream together butter and sugar until pale. Switch paddle to whisk attachment, then add vanilla extract and egg, and whisk on medium speed until incorporated. Sift together cake flour, salt, baking powder, and almond flour. Slowly add dry ingredients to batter, then mix just until combined. divide batter between 6 (7cm) ring molds on a lined sheet pan, piping batter 1/6th of the way up the sides of the molds and then lightly tapping sheet pan on counter to flatten tops of cakes. Bake 7-9 minutes or until cakes are fully cooked. Chill before making mousse. In a small sauce pot, combine milk, chamomile leaves, and lemon verbena leaves and bring to a simmer. Turn off heat, cover pot, and let steep 10-15 minutes. Whip heavy cream to a soft peak, then set aside. Mix together gelatin and water until there are no lumps, and let bloom 5 minutes. Using a fine mesh sieve, strain leaves from milk, squeezing out any extra milk the leaves have absorbed. Discard leaves. Heat milk over low heat again, and mix together yolks and sugar. Whisk yolks into heated milk, then gently heat until milk thickens and eggs cook lightly(basically make an anglaise). Add gelatin, and heat until gelatin has melted. Let mixture cool slightly, then gently fold into whipped cream until everything is combined. Divide mousse between each ring mold, then refrigerate and then freeze until set and ready to unmold.